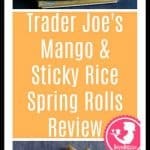 The pros: Trader Joe’s Mango and Sticky Rice Spring Rolls are a completely different type of dessert. This product is not overly sweet. The cons: If you are used to overly sweet desserts, then you might think of this as a palate cleanser. In fact, at my local TJ’s this is with the appetizers and not with the dessert products. The verdict: When I think of dessert, cake, cookies, and chocolate all come to mind. Rice not so much. I’m not a rice pudding fan and I appreciate the fact that rice can be used in sweet applications in addition to savory ones. So when Trader Joe’s rolled this out as part of their August Fearless Flyer, I decided to give it a go. I’m not sure what I was expecting when I bought these, but I thought they would be much sweeter than they were. 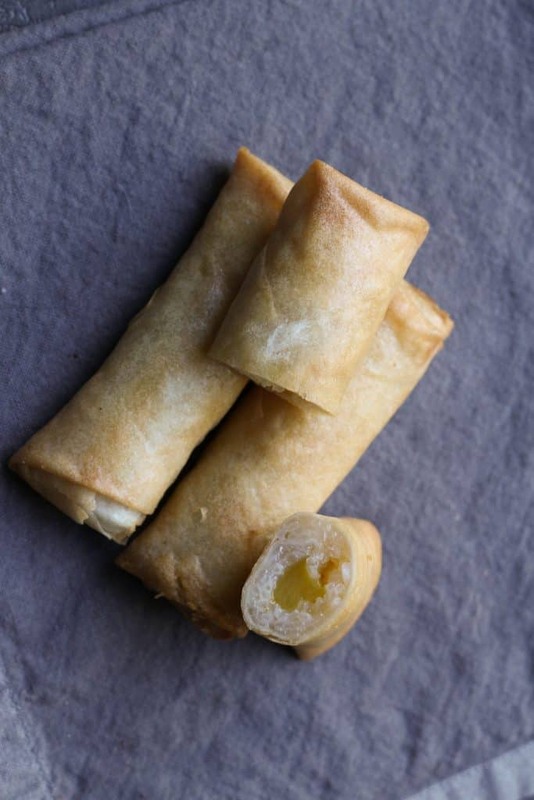 The exterior spring rolls are pretty standard. You get slightly greasy fried wrappers on the outside. While they aren’t too greasy, you’ll absolutely notice a sheen when they come out of the oven. The wrapper is sturdy enough to be held and sliced without the product falling apart. When they cooled a bit, you get a unique pairing of flavors: rice, coconut milk, and mango. The sweetest component seemed to be the mango. The mango did have a cooked texture to it. It was soft and did not have much texture left to it. The sticky rice is well, sticky. All the grains seemed to be holding on to one another. As an added flavor bonus, these have coconut milk added for additional flavor and sweetness. However, I’m using the term sweet loosely. This really isn’t a sweet dessert. 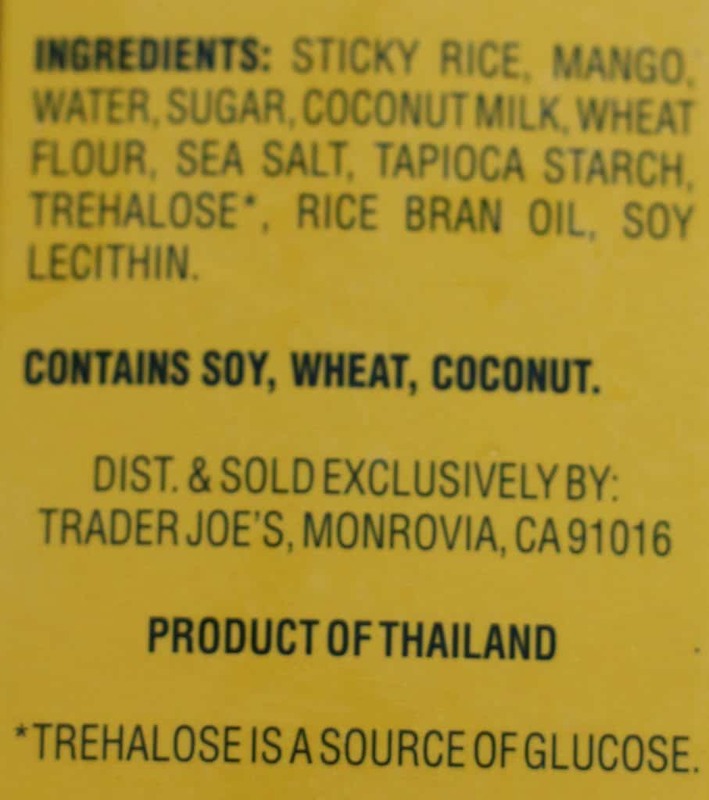 In fact, at my local Trader Joe’s this product is found with the appetizers in the frozen section and not with the desserts. For $2.99 you get five well constructed spring rolls. That is enough for dessert for two. As for me, I tried it but did not love it. When I think of dessert I really crave a before bed sugar high. This would be better in the middle of a meal to cleanse my palate rather than a dessert. Speaking of dessert, if you don’t like sweet desserts then this is a good one to reach for. But if you are like me and want that final bit of sweetness in your day, then there are better ways of using your calories. Would I buy this again? 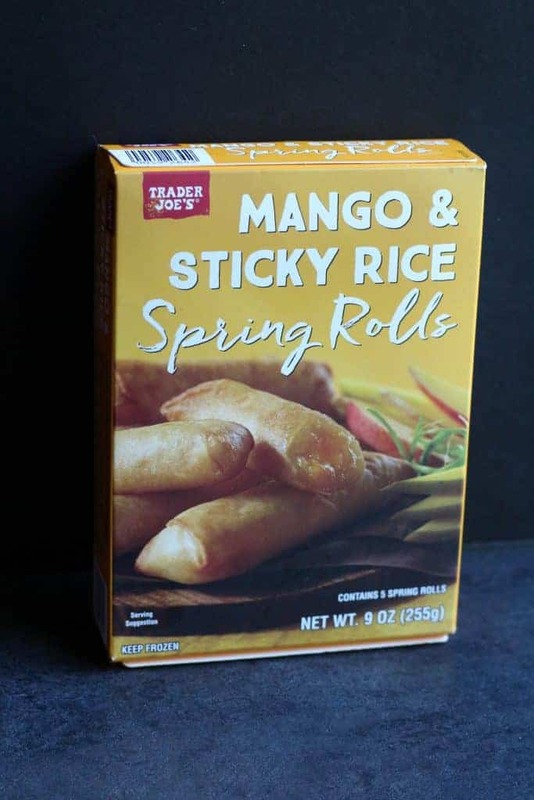 While this was fun to try, no I won’t be buying Trader Joe’s Mango and Sticky Rice Spring Rolls again. They weren’t bad, but not what I would reach for in a dessert. Interesting… This mornings email had another review of this product by different TJ’s review blogger.. She thought they were awesome and not too sweet.. She did the frying method.. I also did not buy them for a dessert but more of an appetizer or snack. I found them to be delicious!! Only thing is that you have to remove the entire packaging, I kept them in the black tray but found it to be quickly melting and the instructions only said to remove the plastic wrapping. I will be buying these every time I go to TJ’s!